I'll try to keep this post brief, because while I don't know why most of you show up here, I have a feeling it's not to discuss the merits of endurance exercises. But, while I'm working through the backlog of momentous life occasions of the last few months, this one definitely warrants remembering. 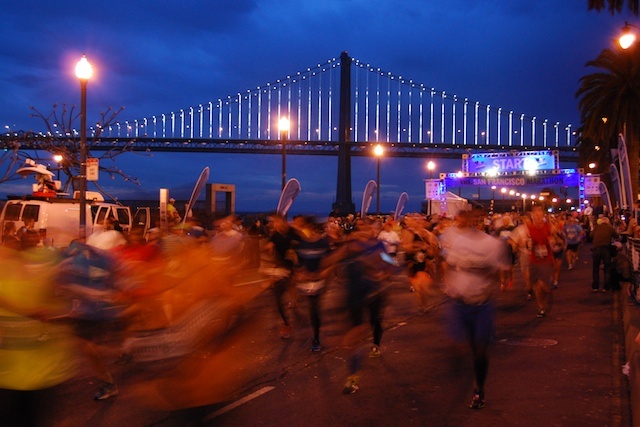 I ran the San Francisco Marathon. I know, right? I really can't believe it, either. This was back in July, actually. So much has happened between now and then that it seems ages ago but I promise it is not forgetfulness that's making me say this: it was awesome. I had the time of my life, I had so so so so so much fun. 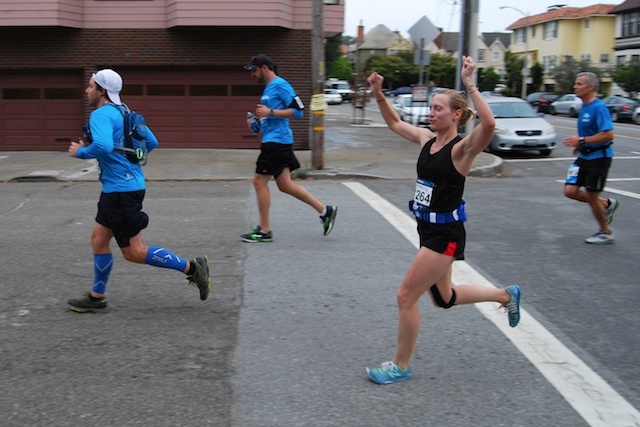 Just look how pumped I was at mile 11 (below). Now of course, this was less than halfway to the finish line and I did not look nearly so enthused or energetic at mile 22. But no matter. It. Was. Awesome. By now either you're grinning in understanding or shaking your head and re-considering reading this clearly crazy person's blog, so let's move on. The icing on the cake was really all the incredible support I had. My parents flew a full three thousand miles to be there, my uncle came up from Nashville, Kai's parents and sister and her husband endured the early morning BART train and pushed their way to the finish line to cheer me on. And on top of all of that, sneaky secretive Kai lined up friends of ours to be out on the course, surprising me nearly every mile marker from 11 to the end. A seriously accomplished half-marathoner coworker of mine also came out to support me - appearing unexpectedly on the course next to me around mile 22, matching my painful stride and pep-talking me up and over a gnarly hill. As we reached the top, she told me: "That's the last hill of the day, it's all downhill to the water and then you're done, you've got this!" and then she faded back into the spectators. I don't even know how to describe how much I needed exactly what she gave me in those few minutes. In no way did I do this race alone - another reason it was really some of the most fun I've ever had. 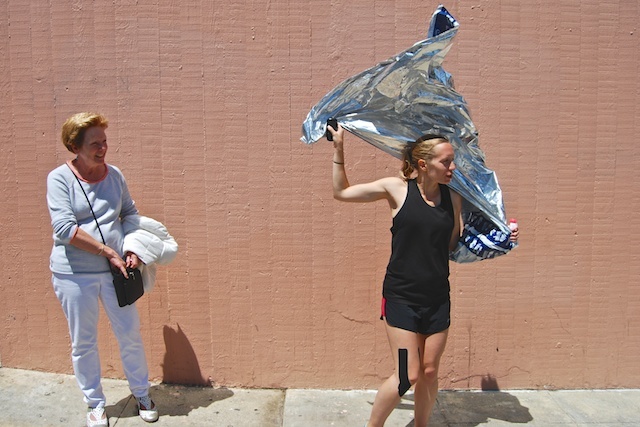 For whatever reason, running 26.2 miles is a thing I have been terrified of but wanting to try for many years. Not only did I finally try it, but somehow I did so without letting it be a neurotic, competitive, anxiety-filled experience and I just ENJOYED IT. I truly enjoyed it. Now I can cross it off the life list, but the truth is I am already considering doing it again. Pittsburgh, I'm looking at you... looks like registration opened today, in fact. I cannot even begin to tell you how proud I was of you for doing this. It was a very emotional moment for me seeing you achieve something so important to you - crossing that finish line. Love you so much that you go for what matters to you! You're awesome.